President Maithripala Sirisena yesterday proposed that the final reservoir of the Mahaweli Development Programme, Moragahakanda, be named after the late engineer, A.N.S. Kulasinghe. Kulasinghe. who was closely involved with the Mahaweli Development Programme, was the Chairman and Founder of the State Engineering Corporation (SEC) and Founder Chairman of the Central Engineering Consultancy Bureau (CECB). “Many suggested that I name Morgahakanda, that I name it after myself, but I rejected them all,” President Sirisena said addressing a gathering at a ceremony held to commemorate 42 years since the opening of the Polgolla Diversion project - the beginning of the Mahaweli Development Programme. “Kulasinghe, who was also acclaimed internationally, was a great human being. This will not only honour him but also all engineers who have worked for this country and the Mahaweli,” he said. The ceremony which also marked the end of the Mahaweli Development programme with the opening of Moragahakanda, the final of the five great reservoirs of the programme, had the President’s reminisce about his arduous journey. “The Mahaweli Development programme was first discussed by politicians and experts in the 1930s. S.A. Wickremesinghe speaking in the senate had spoken of diverting the Mahaweli to the North. As a result of that, initial feasibility studies were undertaken, including that of Moragahahakanda,” he said. President Sirisena recalled that he came by bus and stood by the dam’s embankments to watch the ceremony that followed when the Polgolla Dam was declared open by then Prime Minister Sirimavo Bandaranaike in 1976. “From that day to the date, the biggest multi-purpose project undertaken was the Mahaweli Programme under J. R. Jayewardene and Gamini Dissanayake. During Bandaranaike’s era, in the 60s and 70s, Soviet engineers, had drawn up a 30 year plan to complete the Mahaweli, but the 1977 government focused on industry and energy and they initiated the accelerated programme,” the President said. “Whilst the magnetic personality of Dissanayake ensured that the dams of Kotmale, Victoria, Maduru Oya, Rantambe and Randenigala were completed, Moragahakanda was not taken up due to its low power generating capacity,” the President said. “Since then, every politician to the North and North Central Province has taken up Morgahakanda in his/her political platform. 1994, when Chandrika Bandaranaike Kumaratunga was contesting the presidential election, she asked me what is the main subject here. I told her, say you will start Morgahaakanda, but even during her time, it was not realised”, he said. Three feasibility studies were undertaken on Moragahakanda; one by Maithripala Senanayake in the 1970s, Gamini Dissanayake in the 1980s, and by President Sirisena as Mahaweli Minister in the ‘90s. In 2007, the foundation stone for Moragahakanda was laid, “I told then President Mahinda Rajapaksa the story of Moragahakanda, the plight of the farmers and people who suffered without water. We laid the foundation without a penny to build it,” President Sirisena said. He said the JAICA had initially agreed to fund it, but they rejected it later. “When the Chinese came forward to fund it, it was rejected by the previous government,” he said. “For 16 years as a minister I had worked with engineers but then they shifted me and asked me to work with doctors,” he said. “This is the problem in our political culture and what is wrong with it, the President said, “It took five years for the people to get water,” he said. “Thus far, Rs. 230 million was spent on the Moragahakanda-Kalu Ganga scheme, Wayamba Ela project, Upper Elahera Canal Project and the Minipe diversion,” President said. He believed that the projects would lay a strong foundation to improve the agricultural and fisheries economies of the country as well as supply clean drinking water to people suffering from kidney disease in the Rajarata. The President, who placed special emphasis on the need to conserve the environment in the face of climate change, made conservation an intrinsic part of the Mahaweli. “As we open Moragahakanda, we would like to thank the engineers, every worker and politician from the 1930s who has sacrificed his knowledge, sweat and blood to make the Mahaweli a reality,” concluded the President, celebrating his third year in office and the completion of his crowning achievement - Morgahakanda. “When the Mahaweli started, political bickering was the norm, but today we have come together as a national government to complete it,” Prime Minister Ranil Wickremesinghe yesterday said as the government commemorated 42 years since the initiation of the Mahaweli Development Programme. Addressing a ceremony held on the bridge of the Polgolla Dam, the first project of the Mahaweli, the Prime Minister thanked President Maithripala Sirisena for his efforts in making Moragahakanda a reality. “Today, the last of the Mahaweli, Moragahakanda was bestowed with the people and the Mahaweli was completed thanks to President Sirisena,” the Prime Minister said. “Though it was built in 2-3 years, it took 5-6 years to fight for it. If he had given up, we would not have Moragahakanda with us today. But because of that reservoir, the Wayamba, Rajarata and from there the North will receive water,” he said. 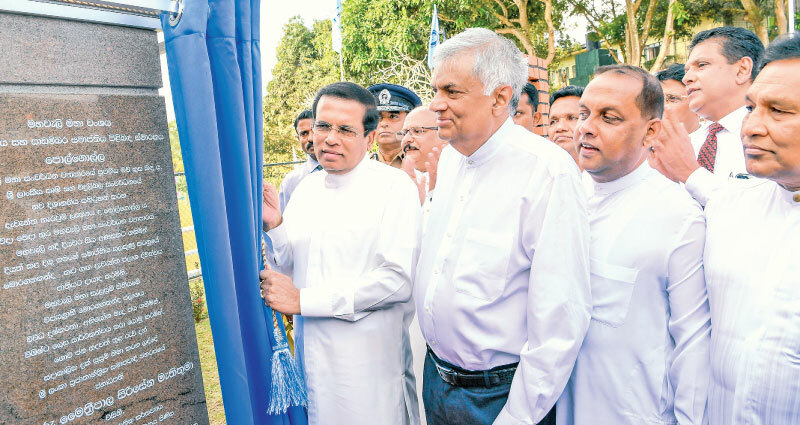 Prime Minister Wickremesinghe, who also made special mention of the late Prime Minister Dudley Senanayake, Keerthi de Silva and the late Prime Minister Sirimavo Bandaranaike, who eventually declared open Polgolla, thanked the past leaders for their efforts in initiating the project. “Forty years ago, I went with Gamini Dissanayake to Ulhitiya, the first dam. The next day, J R Jayewardene came and laid the foundation stone for it. Before I become President, I wanted Mahaweli started. Thanks to Gamini, Kotmale, Victoria, Ulhitiya, Rathkinda, Randenigala, and Rantambe were built,” he recalled. Economic factors postponed Moragahakanda and later because of the war. The Prime Minister called for a new water culture within the Mahaweli system and agricultural practices which take into account the unexpected challenges of climate change. “The Mahaweli made us self-sufficient in rice through the collection of water, but today we have new problems. If we don’t have water, we can’t fill these reservoirs. So we have to focus on changing our agriculture and water management practices,” he said. “Moragahakanda was expected to strengthen the rural economy in the Rajarata. The government would also take measures through industries and tourism to strengthen the livelihood of those not engaged in agriculture,” Prime Minister said. The Prime Minister promised to introduce modern technology to increase agricultural productivity to ensure self-sufficiency locally and for export. “In future we hope for a better economy and a climate that would be kinder to us,” the Prime Minister said.